What a great way to bring joy, fun and excitement to your party! The PhotoBooth does all of that and more. We’ve taken the fun of a traditional photobooth and merged it with new digital technology to bring you a one of a kind experience that adds fun and excitement to your party. Be it a wonderful wedding reception, a formal black tie event, reunion, graduation, or birthday, The PhotoBooth will make your event the most remembered, most exciting, and most fun! Check out our SIX unique photobooth options below! The Classic PhotoBooth is our original and most popular photobooth option! Wisconsin’s one and only Vintage PhotoBooth! It is an open-air photobooth with an antique and vintage look, perfect for your next event! Our Modern PhotoBooth is a sleek, elegant open-air photobooth. 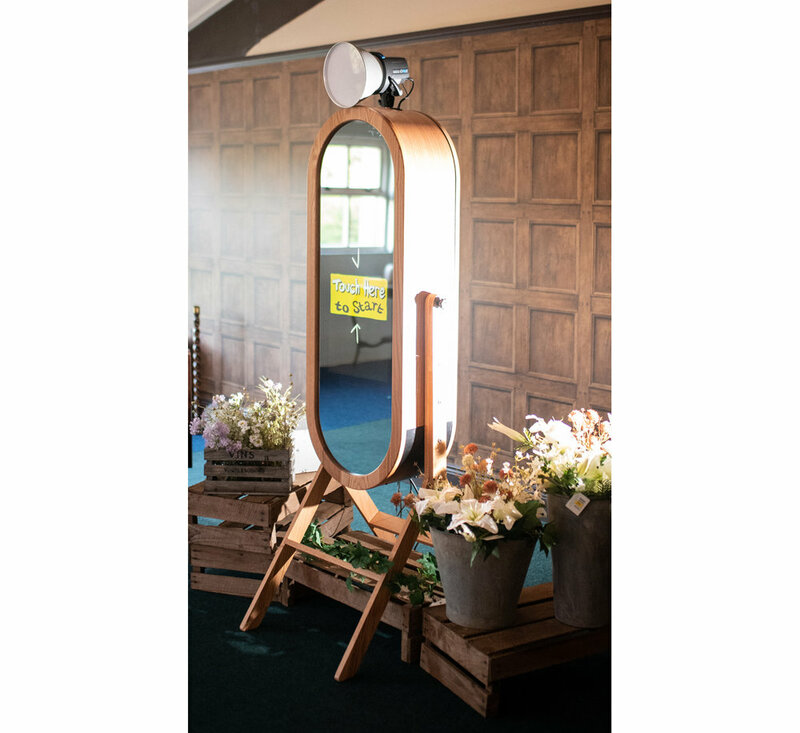 Like the Vintage Photobooth, it can accommodate 2 to 20 guests and you choose the backdrop! The RingO is our newest open-air photobooth option! It can take pictures, GIFs, and Boomerangs that you can send to your friends via text message! Similar to our other photobooth options, the RingO also prints photo strips for you and your guests. Stand in front of our lighted, talking, touch-screen mirror and your guests will be thrilled to have their pictures taken. Want the Red Carpet treatment? We’ll add a Red Carpet Runway and more! Book this truly unique photobooth to reflect all the fun at your event. 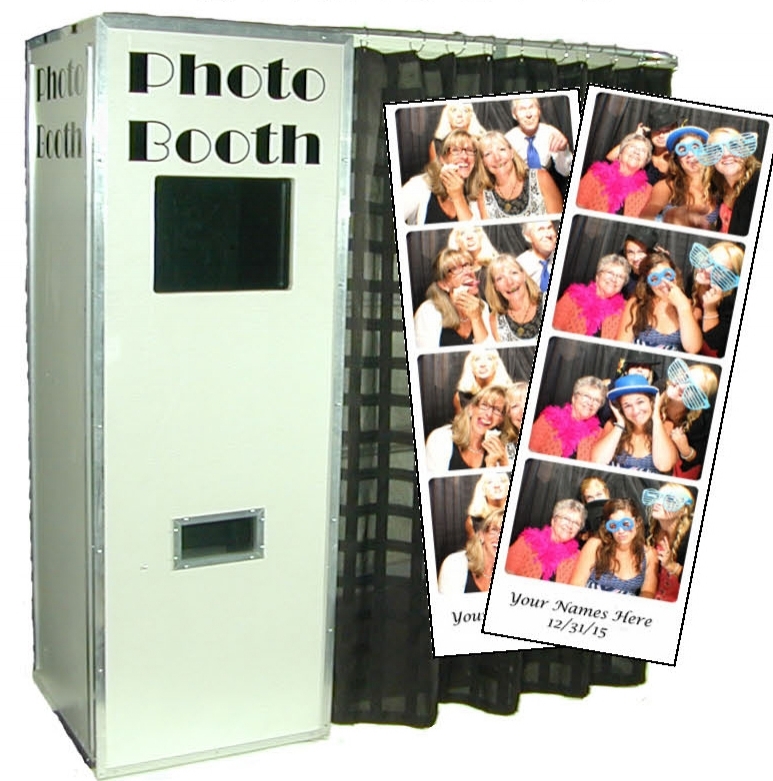 Our handheld FotoPad Photobooth brings the booth to your guests. It can take pictures, GIFs, and Boomerangs that you can send to your friends via text message! 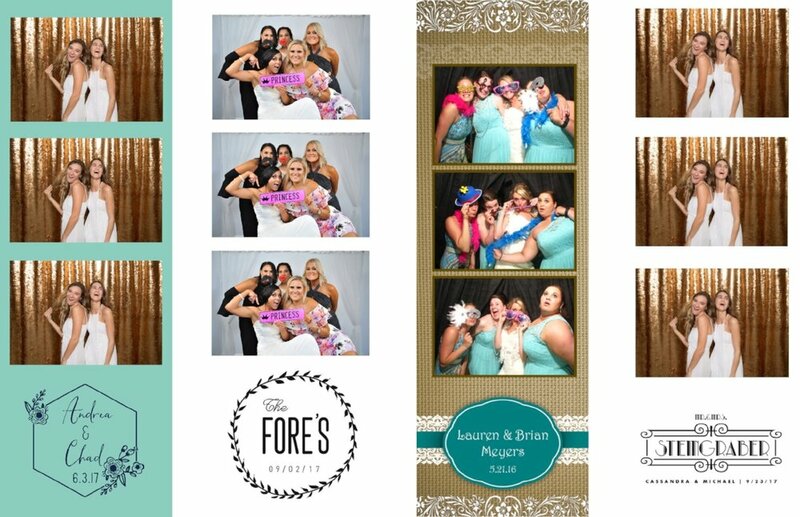 Similar to our other photobooth options, the FotoPad also prints photo strips. 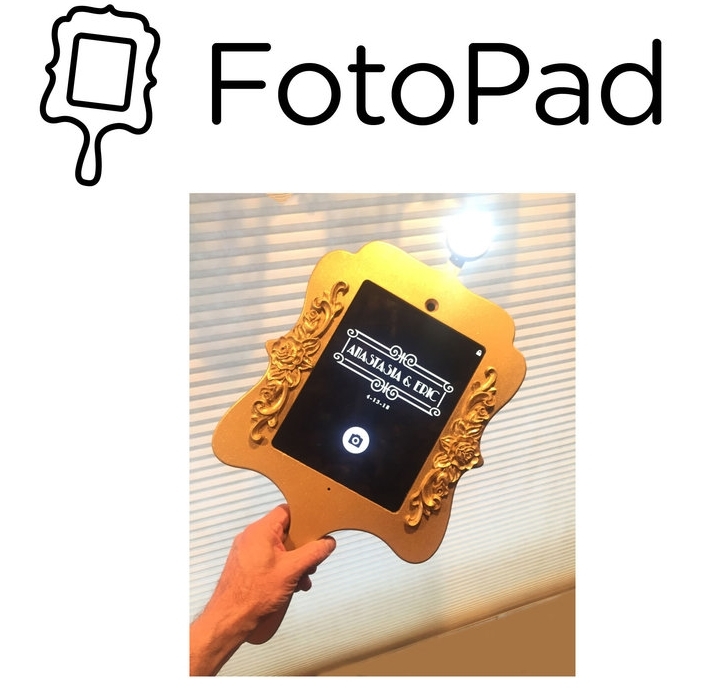 Book the FotoPad for a new mobile photobooth experience. Brand NEW Photo Experience! Why have just one Camera or PhotoBooth when you have at your disposal the hundreds of cameras your guests have brought with them! Guests send their pics to the Selfie Wizard and they are displayed on the Big Screen, automatically printed out… and much, much more! All of our photobooth options above include the items listed below. Each and every celebration is unique. We work to make your pictures a one of a kind keepsake for you and your guests and will work with you to craft just the right photostrip for your day. Below are just a few examples of the hundreds of custom monograms and photostrips we have designed. 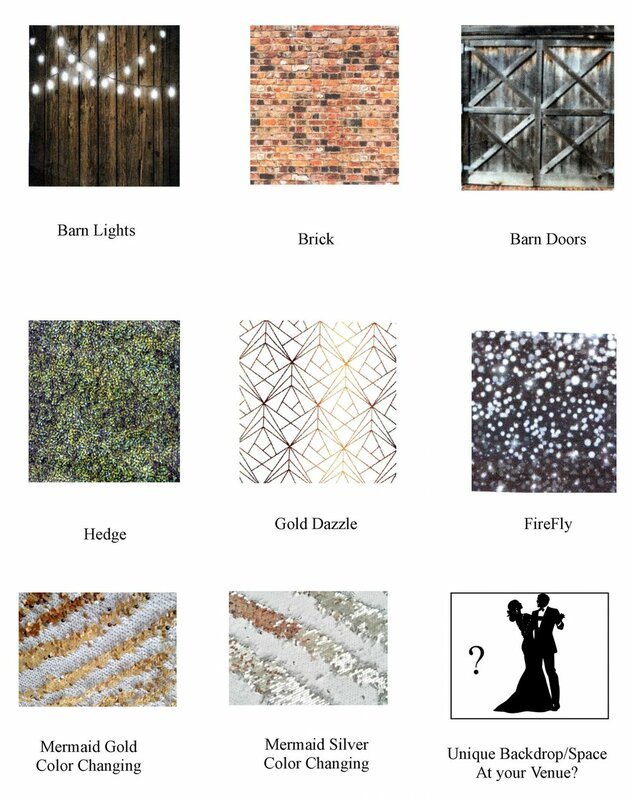 So many choices - lots of great colors and textures in our backdrop selection for the Vintage, Modern, RingO, and Mirror PhotoBooths. Looking for a different color? We can find that for you too! All of our PhotoBooths are completely automatic! Press the button and you’re on your way to fun! Our PhotoBooths work all night long in a space smaller than a banquet table. But don’t let its size fool you. 2 to 20 guests can get their photo taken depending upon the type of PhotoBooth you pick. Our PhotoBooths can be set up in a number of ways to print classic double strips (one for you and one for your guest), 4X6 portraits, or anything you can imagine! Each photo is personalized to your event. All photos are printed on high quality photo stock that will last a lifetime. It’s fast, too - less than 20 seconds to print your photo! Along with photostrips, we provide an elegant scrapbook for guests to add their pictures and their personal messages to you. What a great memory! We include our famous prop and party favor kit with each PhotoBooth. Have some fun with a fancy mask, hat, umbrella, boa, and more! You’re an instant movie star with our Photobooths. While the PhotoBooth does its thing, we’ll watch over you and your guests to ensure everyone has fun. We’ll take care of the scrapbook, help with the props, and much more. It will be a great experience for you and your guests! Looking for a DJ? We do that too! Come check out our PhotoBooths in action at an upcoming area wedding show. Dress up, strike a pose, and chat with us in person to find the PhotoBooth that is perfect you.